In my preparations for the launch of our MSc in Applied GIS, I've been putting together lots of case studies of GIS in action. Luckily for me, this has coincided with the launch of the Motor City Mapping project in Detroit; part of a wider attempt by the city to understand and prevent urban blight. One part of this project has produced an amazing survey dataset covering nearly 380,000 land parcels in the city. 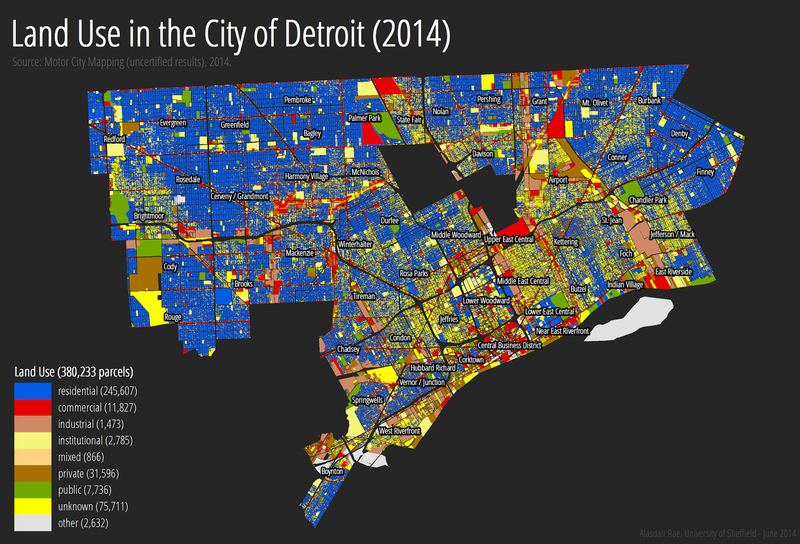 An overview of this is provided by Motor City Mapping in the following graphic. 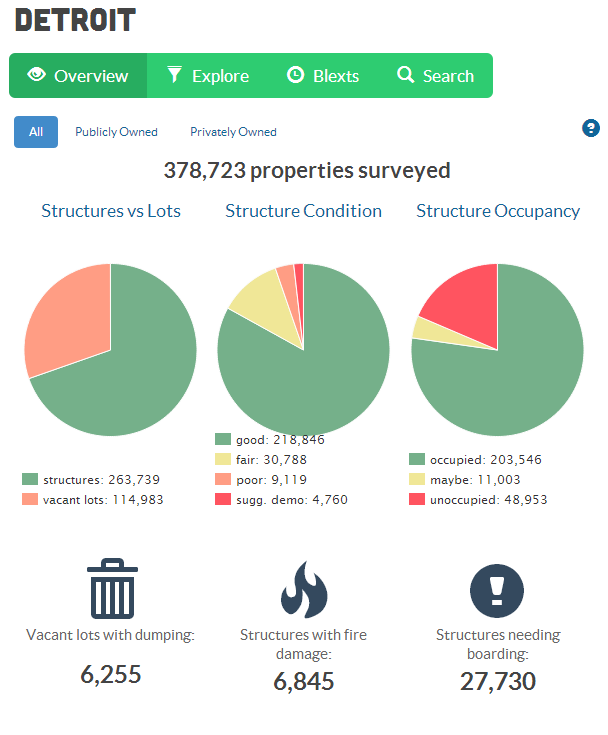 This data was generated by survey staff over a short period of time during winter 2013/4 and is probably the most detailed, parcel-level city survey carried out in recent times. For more about the project, take a look at the short video below. One great feature - in addition to all the rest - is that the final dataset contains a link to the photo taken of each land parcel by the survey staff (residents of Detroit surveyed their own neighbourhoods). The entire dataset is pretty big - close to 1GB - but it can be downloaded via this page and used in your GIS. This direct link worked for me. The image below shows you what it looks like when you map the data using the land use category. Finally, since they very cleverly included a photo url for each land parcel in a separate column, I decided to extract a small area and put it in a web map using CartoDB so that you can click each land parcel and see what it looks like, in addition to some of the characteristics of the parcel. 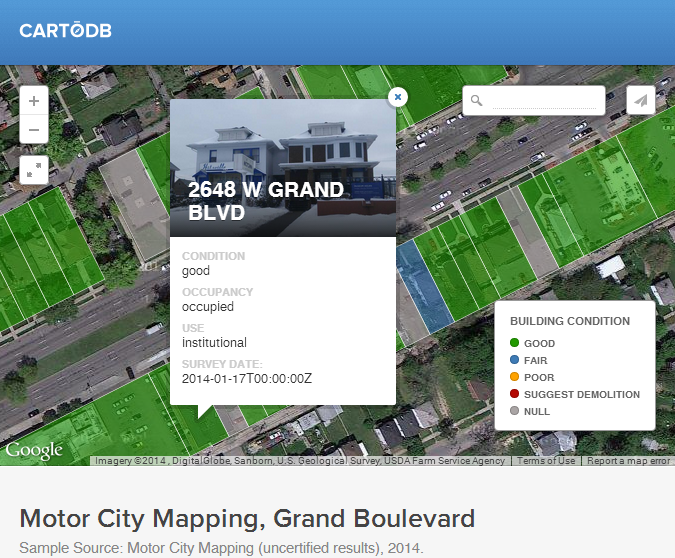 I extracted the data for Grand Boulevard since it's an important street in Detroit's history, with important locations such as Lee Plaza, Motown Records and Henry Ford Hospital. Click on the image below to go to the full size version. You'll see that I've coloured the map by building condition - mostly good on Grand Boulevard - and when you click on a land parcel you'll see an image of what's on it plus details about condition, occupancy and use. I also included a date of when the survey was carried out. This is all part of a wider city planning project called 'Time to End Blight', and you can read more about it on their web pages. The report is a great piece of work in a really difficult time in Detroit's history so it's great to see so many people coming together for this. If you have any interest in cities, urban blight, regeneration or revitalisation then I suggest you take a closer look at the report and its recommendations in particular.